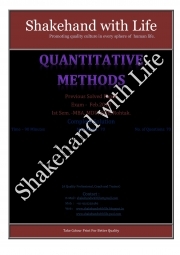 Description of "Solved Paper Quantitative Techniques/Methods Feb. 2012 (eBook)"
The book is solved paper of Quantitative Methods of MBA 1st Semester EXAM , Feb. 2012, MDU, Rohtak DDE. Helpful for the students who are going to appear for the coming examination of MBA , MDU and other universities. Every question in this paper is complete solved for better understanding and for scoring good marks in this exam. Questions are also helpful for Six -Sigma professionals, quality management and general management professionals. Reviews of "Solved Paper Quantitative Techniques/Methods Feb. 2012 (eBook)"